Greenwich, CT. December 20, 2018. 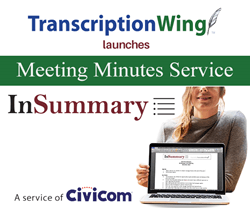 Civicom® transcribing service TranscriptionWing™ has launched InSummary™, a meeting summary solution designed to help clients digest recorded meetings and conference calls with transcribed meeting minutes. In continuing its commitment to provide competitive audio transcription solutions, TranscriptionWing identified InSummary as an answer to a determined need of clients for a cost-efficient and more convenient meeting summary service. With the new InSummary service, clients can obtain a greater value from their meetings and are better empowered to arrive at well-informed decisions from detailed and accurate meeting minutes. TranscriptionWing’s new InSummary meeting minutes service enables executives to make well-informed key decisions from accurate, quality meeting summaries from their recorded conference calls or meeting sessions. To use InSummary, clients simply request summaries of their meeting minutes by providing audio or video recordings of their conference calls or meeting sessions. Clients can then choose among a standard 3 to 4-page summary, a more concise 1 to 2-page executive summary, or provide their own custom specifications. 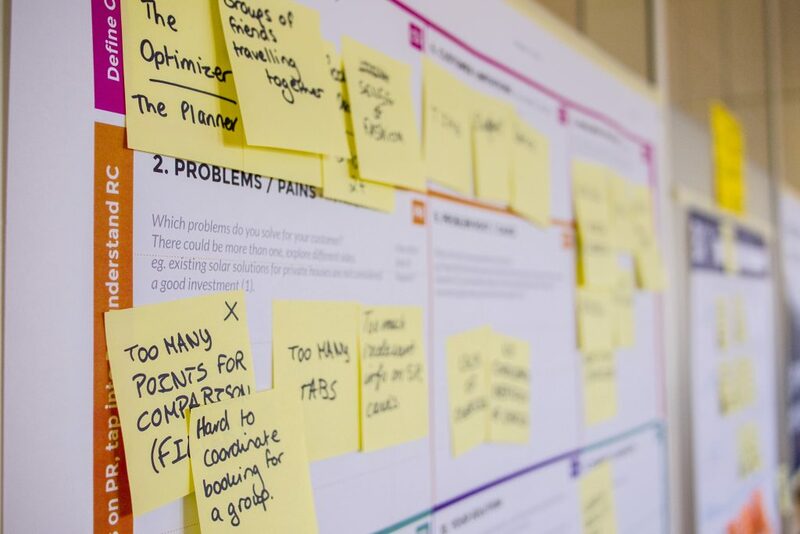 Clients can also take advantage of flexible add-ons to their meeting summaries which can include using a custom format or template, or requesting for a full transcript of the original meeting. InSummary takes away the cumbersome and expensive task of hiring and scheduling a meeting notetaker. Pricing is competitive with industry standards, and costs less than a live notetaker attending an event. Unlike an ordinary meeting summary service, clients can expect faster turnarounds from an all-human team of seasoned TranscriptionWing editors who are well equipped to quickly identify key points made in a meeting or conference call recording and are thoroughly experienced to deliver accurate and quality meeting summaries. Originally established to provide transcriptions complementing Civicom’s conferencing services, TranscriptionWing continues to serve affordable and accurate general transcriptions to various industry sectors including market research, technology, finance, as well as legal, educational, and religious institutions. The general transcription service has continued to develop its processes and offerings over the years while strengthening its new and existing relationships and improving its services to meet different client demands. TranscriptionWing is a service of Civicom Inc., a reliable global leader in proprietary audio conferencing technology, online meeting software, web technology tools, and superior recording capabilities. For more information, call +1-203-413-2414 or visit https://www.transcriptionwing.com. Conference cal l transcriptions are rather highly valued in the world of business, primarily because it allows people to review important decisions and topics that may dictate a company’s or group’s business going forward. It is easy to assume that holding a conference call and then subsequently presenting its recording is an easy task. It is even easier to fail holding a proper conference call and not submit a proper recording for transcription because your audio was so bad that even you, who held and chaired the conference call, was not able to understand even an iota of it. 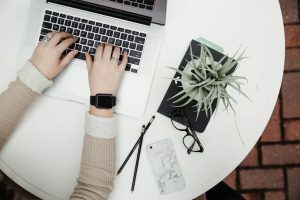 Thus, here is a list of somewhat technical things that should be kept in mind when thinking of planning and hosting a conference call as well as when submitting the recording for transcription. This is certainly the most obvious item on this list and one of the most important to boot, yet so many people seemingly forget this rather commonsensical item. Your conference call is only as good as the equipment that you use for it. Thus, choosing the right conference service provider is the first step to conference call success, and then to a good conference call transcription. There are many things to consider when choosing a conferencing service provider, ranging from price and cost to more technical matters such as how many callers are supported and what vendor is providing service in its conferencing technology. Like many things, how you choose between all of them depends on what exactly you need to accomplish in your conference call. Why choose the most expensive services when you’re only going to conduct a ten-minute call between four people and all you want to talk about is the weather in, say, Antarctica or something? So, choose the conference service provider you would use depending on your stated goals for the conferencing. Just don’t expect that the more mediocre ones, which cost low or may even be free, would rival the quality that can be found in the higher-priced services. You get what you pay for, after all. Quite a lot of conferencing services give you the choice of either using traditional phone lines or VoIP (internet audio). If this is the case, then opt to use traditional phone lines. Depending on the service provider, you don’t lose out on anything, even if you’re planning to host a web conference, because some services offer relatively seamless phone audio integration into a web conference so you get clear audio for your online happening. Even with the advent of such things like fiber optics cables and whatnot that have dramatically increased the reliability of the Internet, it is still a relative newcomer to technology, especially when compared to the telephone, which has been in existence in some way or another for over a century now. The telephone has been given time to mature to a stable state, whereas VoIP calls, which rely on the Internet, still has bugs here and there. Sure, it may have improved by leaps and bounds compared to, say, a decade ago, but the fact remains that even with a strong Internet connection, VoIP calls still experiences pops, clickings, strong feedback, and other such noises due to the digital sound file. Those kinds of noises severely hamper and will no doubt reduce the quality of your conference call recording and transcription. If the service provider gives no option other than to do a VoIP call, then make sure that you’re connected to a reliable Internet connection. Use an Ethernet cable to connect your device to the Internet, as this has noticeably less latency and lag than using a Wi-Fi connection. Ideally, you should use a landline phone with a headset rather than a handheld phone or over speakerphone. Cell phones, while generally having reliable connection, are still far inferior to the quality that landline phones can bring to bear. Landline phones don’t pick up a lot of background noise, as well, compared to cell phones and even speaking over speakerphone. These background noises will make it harder for a conference transcription service to generate quality conference call transcriptions. For even better call quality, use a headset or earpiece hardwired to the device that you are using. A good headset or earpiece helps you further eliminate background noise and control volume settings and the like, which can be a godsend when there’s so much noise around, like when some construction work is going outside of the office and you can’t exactly mute it altogether. Avoid using Bluetooth-connected headsets as these are less reliable and more prone to being disconnected than a hardwired headset or earpiece. Try to pick the quietest room to do the conference call. If you’re in your office, try to find a small, closed, and secluded room free from background chatter or sudden interruptions from officemates and whatnot. Mute other phones and electronic devices that could make noise in the area. Before starting the conference call, post a placard or some sort of reminder outside the room to dissuade would-be noisemakers from making noise and disturbing your call. Virtually all conferencing call providers provide an option for muting participants in the call. Get familiar with this function, for this will no doubt be one of your best allies in the call to come. Ask your conferencing call provider for the specifics of the muting they provide, and use them accordingly. Tell all participants in the call to mute themselves when they are not speaking, as not muting properly will lead to the bane of conference calls: sudden background noise that was unexpected yet still came, such as dogs barking, cats meowing, horns honking, strong wind blowing or someone shouting something. Such things will damage your conference call recordings and transcriptions. Related to this, use the volume controls on your landline or device to raise or lower the volume required to be heard and to hear the conference call. Adjust your headset when other participants have trouble hearing you speak. This is an entry in this list that a lot of conference call participants inadvertently make. Being close to the microphone amplifies such “plosives” as b, d, g, k, p, and t which makes a rather annoying popping sound that is a genuine nuisance and mood basher for the other participants. To avoid this, put your own microphone to the side of the lips and not directly in front. Adjust the position of your headset until you get it just right, and try to hold it with a finger or two to steady it while you’re talking. Also, make it a habit to ask other participants if you’re getting it just right. This will avoid any unwanted interruptions or annoying noises in your conference call recording and transcription. This also has the effect of actually reducing the likeliness of echoes happening, which can further deteriorate the quality of your recording and subsequent transcription. Don’t skimp out on having a large file at the end of your conference call and instead opt for converting your file to the largest possible processing rate. This will increase the file size of your recording, but rest assured for the higher the processing speed in kilobytes, the higher the quality of the recording. Try to convert .wav files to the more common .mp3 format for easier support and playback on computers. If possible, let the file convert overnight so that the good quality conference recording is available the next day for immediate transcription. With the above tips, as well as knowing the best practices for conference call transcriptions, it is almost guaranteed that you will be able to make professional and high-quality recordings of conference call for immediate submission to a quality transcription service who can turn your audio into text and thus make it a hell of a lot easier for you to do your job and get success and rewards. Just remember one thing: the equipment, and how you handle them, are key to a successful conference call recording and transcription. Why is Legal Transcription Important? In any case, whoever may have been right between the two mentioned above notwithstanding, at least one thing for everyone remains clear: the legal profession is a very complicated one. Daily, lawyers, judges, and other legal practitioners sit down and try to make sense of a hundred and one cases, which can differ wildly from something as comparatively simple as tax evasion to something more complicated such as arson or murder, to the somewhat bizarre or weird such as someone suing someone because a seagull attacked her. With that kind of volume of work coming in, how do legal professionals adapt? How can they make sense of each court proceeding, each and every testimony and affidavit and memorandum and summonses? Enter legal transcriptions, defined broadly as any spoken legal proceeding or dictation into a text format. These kinds of transcriptions deal with all aspects of the legal profession, can be done live or via recordings, and can be created either by a machine or a human transcriptionist. 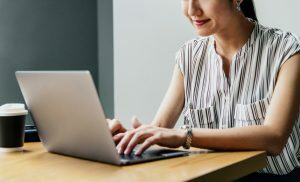 Plan cases better – Perhaps the most important of the benefits that legal transcriptions provide, legal transcriptions significantly make it easier for legal practitioners to review cases and prepare their avenue of attack or defense. The legal profession is often said to be a profession that relies on quick tongues and the ability to keep calm under pressure. Legal transcriptions allow legal practitioners to do the above-mentioned things by giving them the tools to thoroughly prepare themselves to make piercing questions that might just break down the other side’s defense, or else mount a riposte that may even lead the other side to make a mistake that they can then exploit to win the battle of wits. Get accurate information – What can a lawyer do without information with which to pursue the case? What can a judge without knowledge of the case he or she is hearing do? Legal transcriptions give legal practitioners a fighting chance by giving them all the particulars of a given case. Target what needs to be targeted – Depending on how complicated a case may be, seemingly unimportant details that would actually lead to victory in a case can be buried under tons and tons of audio files, video recordings, and the like. Legal transcriptions allow legal practitioners to find these details, study them with an unflinching eye, and then mark them for future reference. Indeed, it would not be an exaggeration to say that legal transcriptions are the bread and butter of the entire legal profession, the Robin to lawyers’ and judges’ Batman, the Jack to legal practitioners’ Rose. Using legal transcriptions allow practitioners of the law to do their job with skill and grace. Of the many types of calls that you can make, conference calls stand head-and-shoulder above the others in terms of being one of the most important ones to make – since it allows you to essentially decide a company or group’s path going forward – as well as being perhaps the trickiest to make and manage and make a success. Sure, it may sound so easy to do one. All you have to do is get some kind of software for conferencing – of which there are tons in the Internet, many of them even free. You then contact the folks who should be participating in the conference call, agree on a time and date, and then you’re all set. Well, were it so easy. Without proper knowledge and know-how of conference call best practices, you may as well not make one, because it is almost guaranteed that your conference call – and the proceeding conference call transcription that you will no doubt request from a conference call transcription service because how can you even review an hour-long conference call without a transcript in hand? – will be pure bonkers without proper guidelines and rules and whatnot. 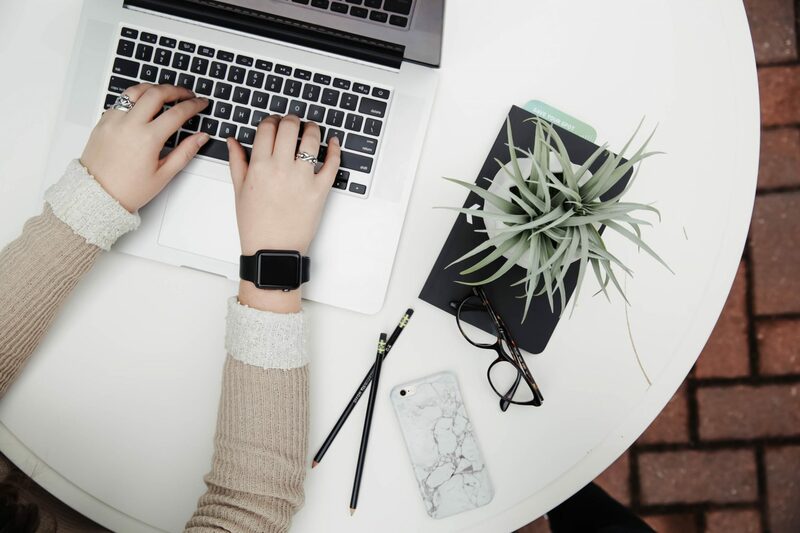 As such, listed below are some general conference call best practices for you to follow both before, during, and after a conference call in order to get the best conference call transcriptions that you can have. 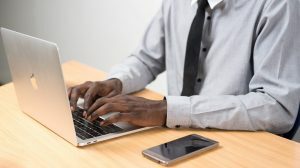 Ensure that all of the equipment is in place – This includes not only telephones and computers but also everything that one may need during a conference call such as essential PDF files or images that you might want to show to your participants. Also, preload applications that you might use during the call. There is nothing more stupid than having to spend precious time waiting for something to load during conference calls. Expect that something will fail – and prepare accordingly – Now, this might sound like peculiar advice, and perhaps it is, but really, coming into conference calls with the mindset that whatever your preparations, something somewhere is bound to fail – whether that’s a participant’s phone line or Internet connection, or worst case scenario, your own devices – helps you think beforehand of what you can do to lessen these kinds of risks and make the call a success. Lay out the ground rules – The first agenda in a conference call should be for you to lay out the ground rules, as it were, of the call so that speakers know what to say and focus on. It also goes without saying that you inform them beforehand of the topic so that they do not come in empty-handed and ignorant and will not have to sit there listening without ever contributing anything to the discussion at hand. Have your participants identify themselves – Something that gets annoying really quickly in conference calls is having a bunch of people who sound so much alike to the point that you and the other participants of the conference call have a hard time identifying who exactly is speaking at a given moment. Letting this kind of thing happen complicates things for you. Thus, it is vital that you at any time that participants speak, you have them identify themselves by name. Properly moderate the call – This is the most important point in this list. A conference call without a proper moderator would end up directionless and would simply meander around different topics and talking points without getting into the heart of things. Thus, a moderator that can properly guide the participants back into line whenever they get out of hand is a must. A moderator must wield his or her power as the moderator to straighten out or smoothen problems before they develop and snowball into disasters that would render your conference call moot and pointless. Specify formats and other concerns, if any – When the call is over and done and you send the recordings that you have to a conference call transcription service, make sure that you explain properly if there is a specific format for the transcript that you want delivered into your hands. Send to a quality conference calls transcription service – This is of course common sense. If you want a good transcription of your conference call, you send it to a good and quality conference calls transcription service. Do not expect a very perfect job with the transcription – This is another entry into this list that might seem weird or unneeded advice, but this is also important. Even conference calls that were heavily prepared for and was moderated by a skilled moderator can have hiccups and iffy parts here and there, thanks in large part to the fact that conference call participants do not see the body language and non-verbal cues of their fellow participants and thus may start speaking at the same time. Audio such as these is usually hard to properly understand, again depending on the participants. As such, be ready for an unintelligible part or two in even conference call transcripts that followed the other things on this list. As in number two of this list, be prepared to lose some battles but win the whole war, as it were. Following the list above should help you turn out a better conference call recording and thus be able to better utilize a conference call transcription.